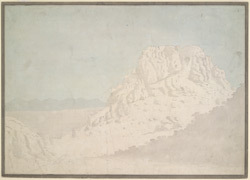 Unfinished pencil and wash drawing of a hill fort in Karnataka in South India by Sir Alexander Allan, 1st Baronet (1764-1820) sometime between 1790 and 1792. This is one of four drawings of hill forts in South India made in a similar style by Alexander Allan. Allan served in the 3rd and 13th Madras Native Infantry from 1780 to 1804. He took part in the third (1790-92) and fourth (1799) Mysore Wars. At the siege of Seringapatam in 1799, Allan was sent to the palace of Tipu Sultan with a flag of truce.